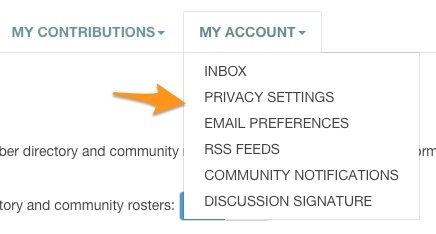 You can change both your privacy settings and the email notifications you receive from your communities like the Open Forum. To change your Privacy Settings, start by accessing your Profile by clicking your profile icon in the upper right corner of the page header. Then click on the PROFILE button. Once you are in your profile, click on MY ACCOUNT in the menu bar under your name and then Privacy Settings. You have a few options on how your information can seen by other community members under Privacy Settings. You can be hidden from the members directory and the rosters of the communities you join by changing the directory setting to no. To change your Email Notifications, navigate to you Profile by clicking on your icon in the upper right corner of the page header. 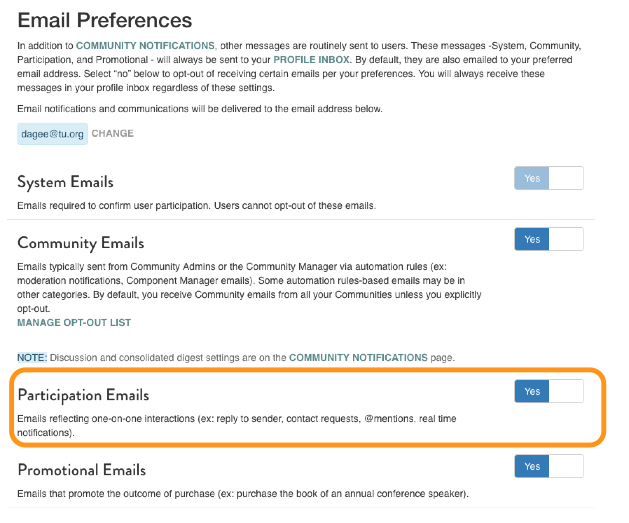 You have settings you can adjust for Community Emails, Social Emails, and Promotional Emails. The description of each type of email is listed on this page. Then place a check in the Consolidated Daily Digest box for the communities you would like to be delivered in one digest. If you're opted-in to real-time participation emails, you'll be notified via email any time someone replies to one of your threads or comments, ensuring you're immediately aware of the latest developments. NOTE: These real-time participation emails are separate from your community subscription emails like the Daily Digest. How do I receive these emails? Unless explicitly disabled, you'll automatically receive these emails when users reply to your threads and comments. TIP: Even if you haven't participated in a thread but are interested in what your peers are discussing, you can manually enable participation emails for a specific thread. Just navigate to the thread and click the star icon. How do I unsubscribe from these emails? If you decide you are no longer interested in the thread or comments, you can unsubscribe via a link in the footer of the participation email. 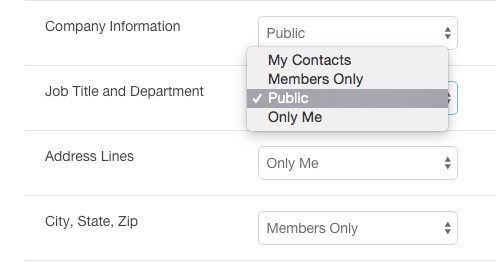 If you want to completely opt-out of receiving any participation emails, you can change your preference via your profile > My Account > Email Preferences, and set “Participation” to No (off). Questions? If you have any questions on how to change any of these settings, please contact the COMMUNITY MANAGER. We are glad you are part of the TU community.